A lot of writers select Grammarly because you can use it in so many different ways. 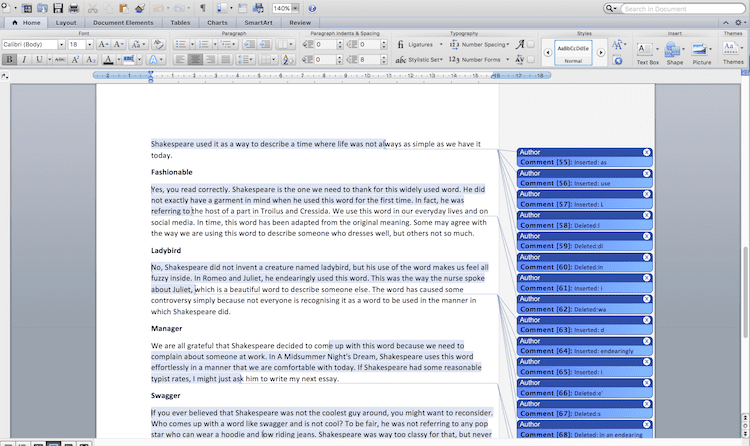 When you install Grammarly for Microsoft Office as an add-on for Microsoft Word or Outlook and enable Grammarly in a browser extension for Chrome, Safari and Firefox, you can use it almost anywhere you write. The latest version now supports Google Docs as well. 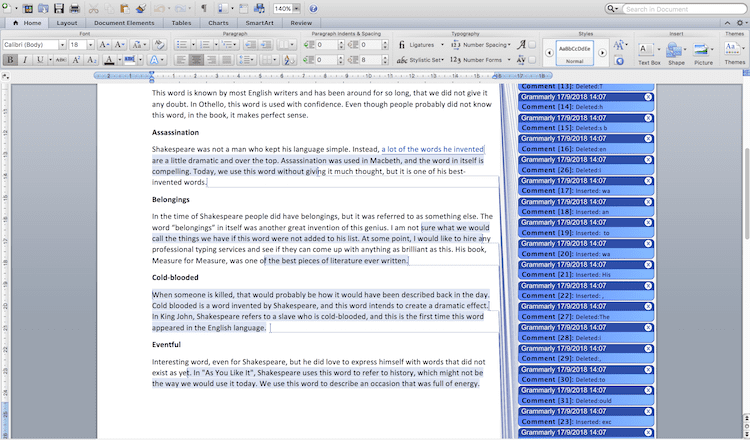 Microsoft Office integration with a Grammarly tab is not available for Mac users, but it is very easy to use the desktop app for Mac, which is a fully optioned online editor. It is extremely fast too. The check for grammar and plagiarism duration time is only a few seconds. Whether you use the MS Office version or the Mac editor, there is one small issue that many users would like to resolve. The problem is that when you click the Track Changes in Word, the corrections that Grammarly add are marked as “Grammarly”. If you are reviewing a document and working with an editor or proofreader, you may not want them to see this notation in the track changes feature when you exchange versions of your document. I have seen many users ask this question online, so here is a way that you can easily remove the notation when Grammarly edits or notes insertions and deletions. The fix will work for all Word users, including Mac users who use a Grammarly download for MS Word 2013 or 2011 files to the desktop editor. But first, let me explain the wrong way because I have seen this fix noted online, and it doesn’t work. In the image above, this is what your Track Changes look like when you edit a Word document with Grammarly. Any correction, or when deleting text or making any changes, these will be marked with “Grammarly” as the user. 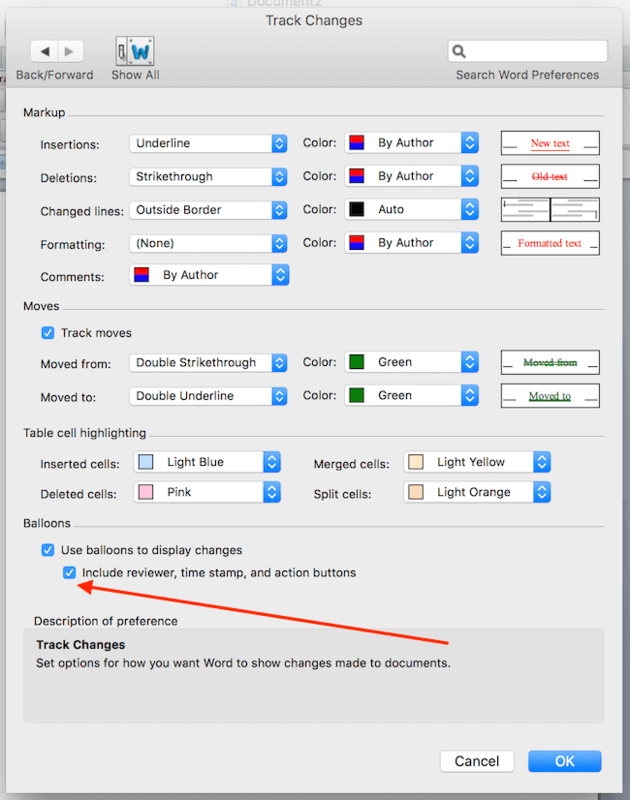 One solution I have seen suggested online is to change a setting in the Track Changes preferences. If you untick the setting marked by the arrow in the image above, it will result in what immediately looks like a good solution. 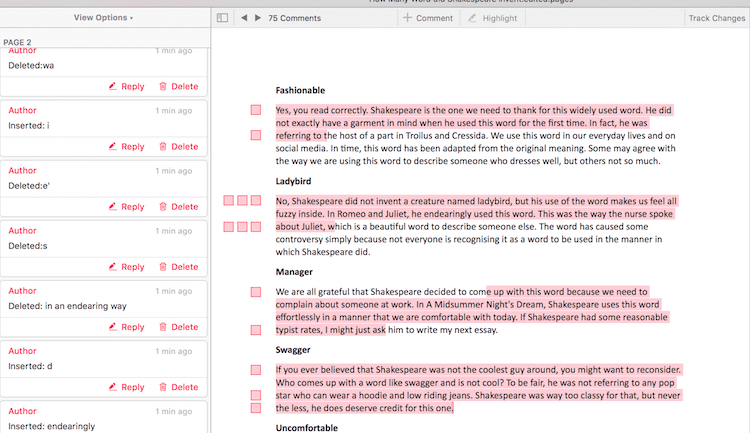 When you turning on track change to see the reviewing pane for an edited document, the comments are now clean, with no mention of Grammarly. But this only looks like a solution. It is not. If you send this document to another user, the Grammarly notations will be visible to them again. It is because this simple markup setting in Track Changes to remove the reviewer is only a local setting on your computer. So only you will see the change and not other users who access your document. They will still see your corrections with Grammarly noted as making the changes. The only way to resolve the issue for all users is to make a change in your security preferences to change the markup displays. The setting is available in all versions up to Office 2016. In the security tab, tick “Remove personal information”. Now when anyone opens your notated document and uses the accept or reject track changes button, all the comments will be marked as Author. If you are a Mac user and you use Apple Pages, when you download Grammarly Word documents into Pages, this solution works perfectly well too. 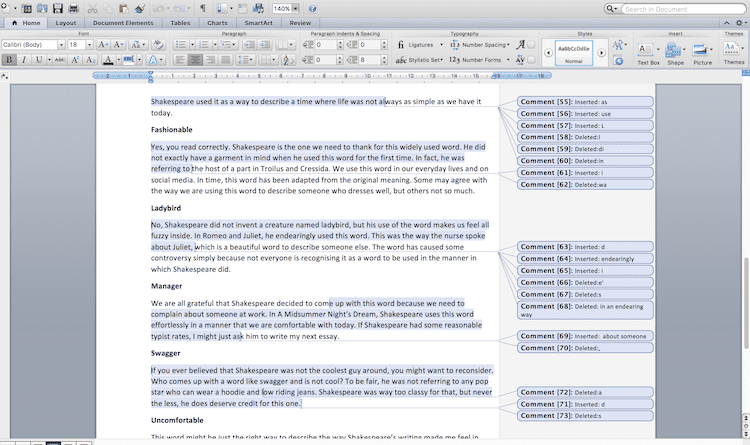 This is because the “Comment and Changes” function in Pages fully supports and is compatible with Word Track Changes. So you can choose to accept and reject changes as you would in Word. You can see in the image below that all track changes in Pages are also marled as Author. 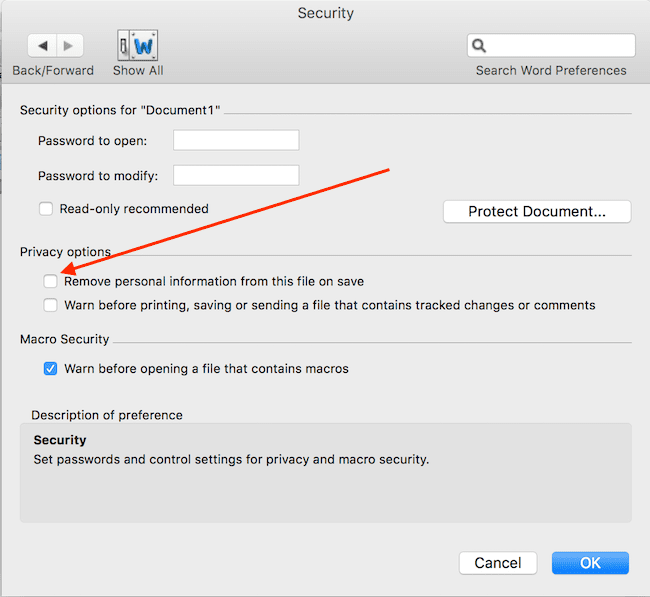 By changing this one small security setting in Word for Grammarly for Microsoft Office or Grammarly for Mac, you can confidently work with other users and be sure that they will not see “Grammarly” noted as the reviewer. While you can exchange and work on documents with anyone using this method, the only small drawback is that all changes made by any reviewer will be marked with the generic description of “Author”. It makes it difficult to know who made certain changes, although the date and time can probably give you a good clue. Also, there doesn’t seem to be any way to edit the default name of “Author” in any Word setting. If anyone has an idea how to do this, I would love to know.